An effective mind map should be organized and clear, which can classify and present ideas in an easy to understand way. You can learn some guidelines for making effective mind maps. Here is a popular mind map maker that can help you build mind map effectively. Its neatly organized ribbon tool bar, auto connection function and rich built-in symbols all make the design process fun. You can try this mind map software right now for free. 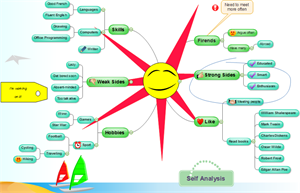 An example of Self Analysis Mind Map is displayed on the right for your reference. It is perfectly formatted and enhanced with clip art. If you want to use more ready-made examples, go to Mind Map Examples page and click on the mina map that best suits you. 2. On start page, click Mind Map in Template Categories list; click a template. 3. Click Create to open a blank mind map drawing page. 4. The Mind Map libraries panel and Mind Map tab open. 5. Drag a Main Idea shape onto the drawing page. Alternatively, you can also get started from a template to save time. To do so: After the 1 to 2 steps above, double click a preferable example to open it. Then you can begin to add your own text to replace the original content. There are several ways to do this. Connectors are added automatically. 1. Press Insert key the first time to add a pair of Main Idea and Main Topic Shapes. 2. Press Insert more times to add more Main Topic shapes. 3. 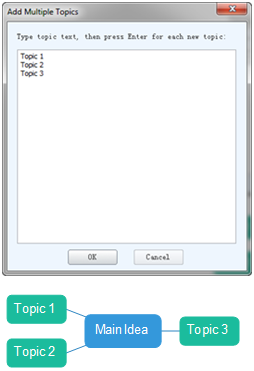 Press Ctrl + Insert to add Subtopic shapes to the Main Topic shape selected. If you want to add more than one topic each time, use Add Multiple Topics. 1. Click Add Multiple Topics on Mind Map tab. 2. Type in or copy topic text to the dialogue box. Note: The number of lines of text determines the topic number. The layout sequence is automatically configured as clockwise, from left to right or top to down. 1. Choose the Main Idea shape. 2. Select a layout style on Mind Map tab. 3. Click Distance on Mind Map tab to Increase/Decrease Horizontal/Vertical Distance if you only need minor changes. 1. Choose the Main Topic shape. 1. Press Ctrl + A to select the whole map. 3. Select the style you prefer. To see more details about Mind Map Layout, please refer to this link - Mind Map Layout. 1. Choose the shape whose connectors you want to change. 3. Select the style you like. The connectors between the selected shape and the shape/shapes of next level will be changed. 1. Move the pointer over the target shape. 2. Drag the shape to the location where you want to place it. The pointer turns into four-direction arrow to show which shapes is selected. When dragging, an orange box appears to show the location. 3. Drop the shape when you have moved it to the location you want. 1. Double click the shape. 2. A red box shows. 3. Type contents in the text box. 4. 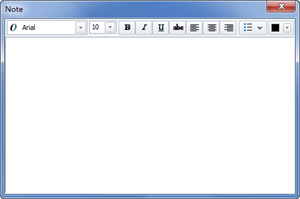 Click a blank area on the drawing page to finish typing. Note: By default, the connectors are locked. You need to click Lock Connector button on Mind Map tab to unlock them if you want to edit them. 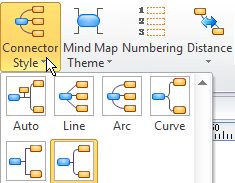 Connectors in Mind Map cannot be added text to. Click Numbering on the Mind Map tab. There are an array of symbols specifically designed for mind maps, such as Numbers, Flag and Arrow. They can be glued to shapes directly while you drag them onto shapes. 2. Choose the symbol you need. 3. Drag it over the shape you want to add symbol to. 4. An orange box shows. Please keep in mind that, when using this function, you can only insert shapes from the currently opened library. The default position is on the left. You can adjust the position by right click on the inserted shape. 1. Click Insert Shape from Library. 2. Choose the shape you need. 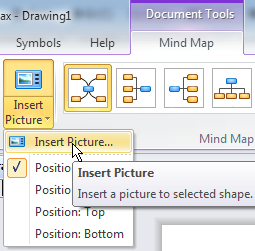 Except for the attached symbols, we recommend to use Insert Picture tool on Mind Map tab to insert pictures to shapes. In this way, the added pictures will be glued to the shapes so that they can be edited together. Otherwise, they are still separate. 1. Select the shape you need to insert shape to. 3. Choose the position for the picture. 4. Click Insert Picture again. 5. Locate the picture you need. Note: The position of inserted picture can also be changed by right clicking on it to choose another position. Some shapes are not connected directly. But you can show their relationship by using Insert Relationship. 2. Move the pointer to one of the shapes you wish to insert relationship to. 3. The connection points appear and the one under the pointer becomes red. 4. Drag the mouse from the selected connection point to another shape's connection point. When you are presenting the mind map, you can use this functionality to magnify details. It can hide the parallel and upper-layer relationships so that you can focus on details. 1. Select the topic you need to focus on. 2. Right click on it to open the right-click menu. 1. Click Create Gantt button on the Mind Map tab. 3. Change the Gantt chart display option. 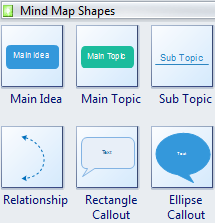 When you open an example in the Mind Map Templates, the Mind Map Shapes stencil opens at the same time. At least one set of shapes are needed to create a mind map, including a Main Idea, Main Topic and Sub-topic shape. 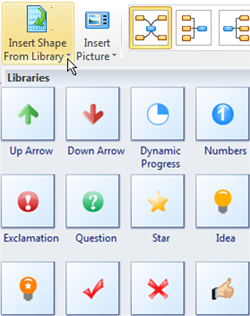 To make the mind map picturesque and fun, you can add the attached symbols or insert shapes from library. 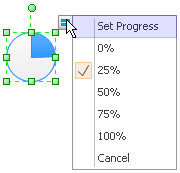 The Numbers and Dynamic Progress symbols are editable. As for the Numbers shapes, you can change the numbers. To change the process status shown by Dynamic Process shape, follow these steps. 2. Move the pointer over the floating button. 3. Choose a pre-defined value of Set Process to specify desired value. 1. 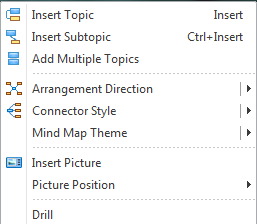 Click Mind Map menu. 2. Click Mind Map Theme. 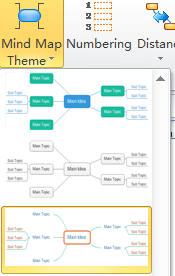 Then the thumbnails of all available Mind Map themes show. 3. Choose your desired theme. You can link your Map to any website you want. To navigate between different pages of your drawing conveniently, you can also link a certain topic to one specific page. Thus, you can show more detail of a certain topic. 2. Right click on the shape to open the right-click menu. 4. Enter the website address you want to link and choose the page number of current document if you want to navigate within your own mind map. Note: If you don't need the added hyperlink and want to delete it. Right click on the shape. Then choose hyperlink and click Delete in the Hyperlink dialogue box. One amazing thing to point out is that you can immediately add notes during your presentation when your audiences give you advice or comments. And your boss can also add notes to your work quite conveniently when reviewing. 3. Choose Note and the Note dialogue box shows. 4. Type in the text. 5. A thumbnail looking like a notebook shows to represent the added Note. Click it to show the note. Note: If you don't need the added note and want to delete it. Right click on the shape. Then delete the text in the dialogue box. 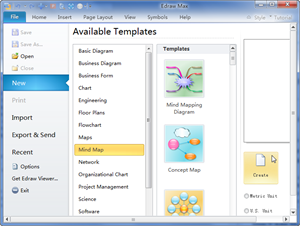 Compared with PowerPoint, Edraw Mind Map's strength of adding attachment lies in its convenience. Right after you add the attachment, the attached document has been saved in the file. That means you don't need to take that document with the file every time you move it. If you send the mind map to your colleagues, they can also see the attachment. 3. Choose Attachment and locate the file you want to add. 5. A thumbnail looking like a pin shows to represent the added Attachment. Click it to show the Attachment. Note: For other viewers of your Min Map, they can even copy the attachments and save them for future use. To do so, click Copy File to in the Attachment dialogue box. Clicking Remove File will delete the attachment. 1. Right click on the shape with hyperlink. 2. Select Click Event Map. 3. 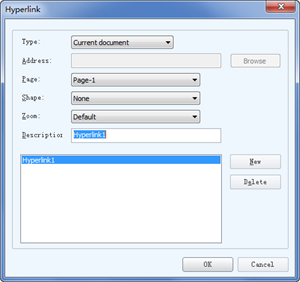 Choose Hyperlink in the dialogue box.